This is the second St. Stanislaus Catholic Church in Chappell Hill. 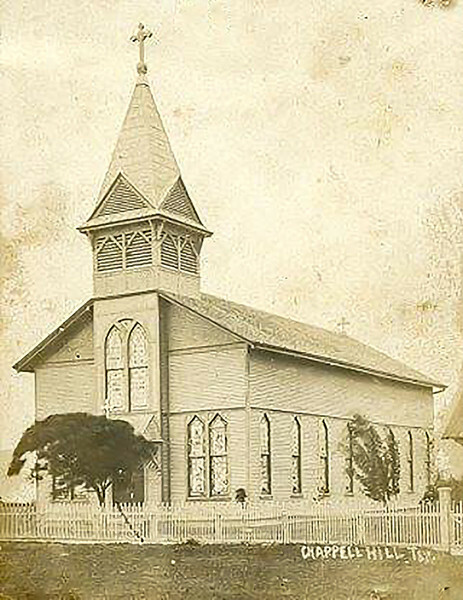 It was built in 1901, after their first church was destroyed by the 1900 Hurricane. My parents were married at St Stanislaus, I was baptized there as well as six of my seven siblings. This photograph is part of the Felchak family pictures and it is a post card. St. Stanislaus will celebrate their 125th Anniversary in November of this year. Fr. Jozef Musioł has asked me to write the history of the parish. I am appealing to the descendants of the Polish settlers of Chappell Hill to check their family photos to see if you have any that pertains to the church history. We will scan your photograph and then return the original photo back to you. The church pictured here was destroyed by a fire on December 4, 1921. Therefore, the current church was built in 1924. I thank you in advance for your help and consideration to look at your old family pictures. My contact telephone is 713 937-8222.